After 38 years as the Liberal Democrat candidate for Bermondsey (32 years as the MP), Sir Simon Hughes has officially retired from politics to concentrate on various community activities including being Chair of Governors at Bacon's College and Chancellor of London Southbank University. 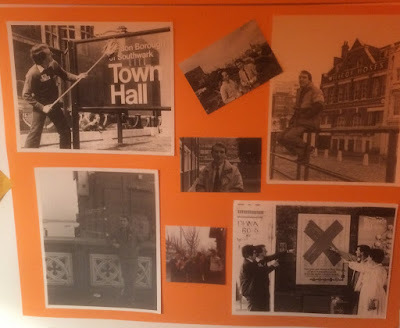 Last night at the Shortwave Cafe in Bermondsey there was a celebration of Simon's work for the Liberal Democrats in Bermondsey, in London, and nationally. Interspersed with speeches, were video contributions from past members, and a Skype Call from Nick Clegg, prevented from being present in person. It was warm, affectionate, and amusing. It was a well deserved tribute to massive act of public service, sustained over nearly four decades, and still not ended. Thank you, Simon. 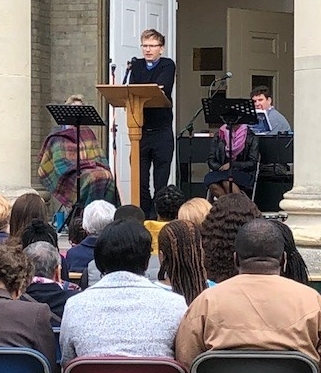 Some years ago I led a parish weekend for this wonderful church in Blackheath and it was great to back with them today. 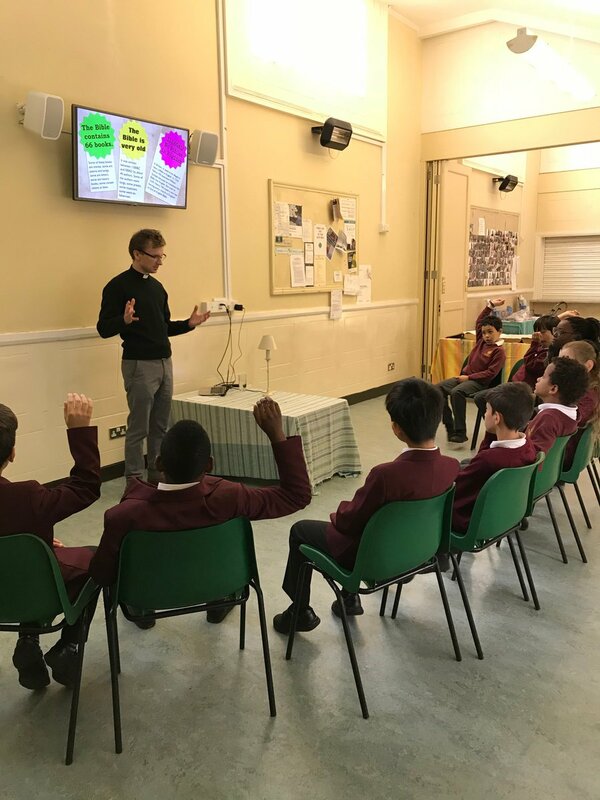 In addition to activities for the children and young people, a sumptuous lunch, and a post lunch stroll in nearby Knole Park we had three teaching spots interspersed with buzz groups and discussion groups for the 150 people who had booked in for the day. First up, after opening worship, we looked at theWonder of the Church from 1 Peter 2 (a chosen people, a royal priesthood and holy nation), and the Church's treasure from 2 Corinthians 4.6-7 (the light of the glory of God in the face of Christ). 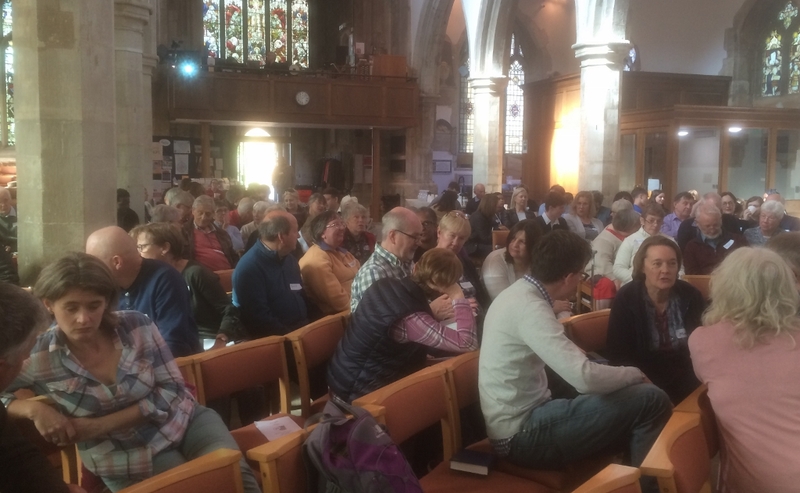 After coffee, we considered How to be an Ambitious Christian, looking at Colossians 3.17 and Philippians 3.7-14, rounding off the morning by looking at Romans 12 and the Apostle Paul's exhortation, in the light of God's mercy, to offer ourselves as a living sacrifice. 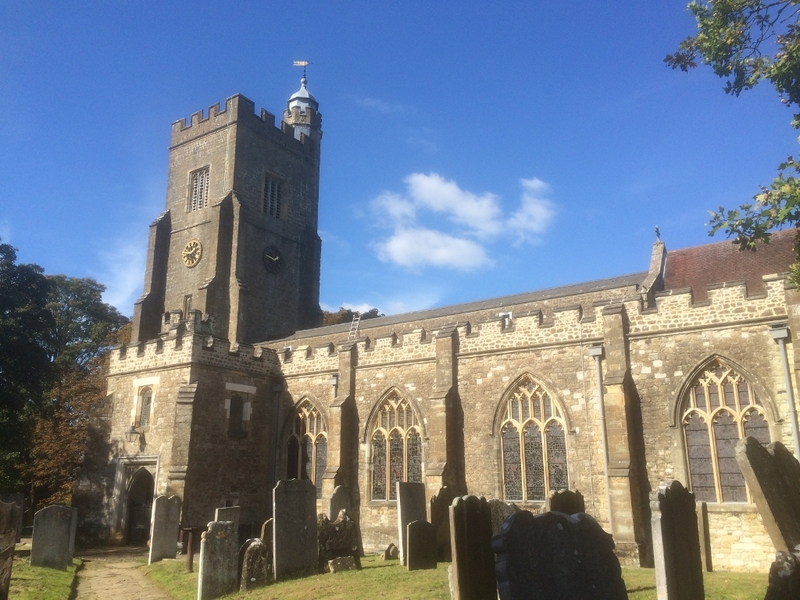 After lunch and recreational activities in Knole Park, we rounded off the day with All Age Worship, including contributions by the children and the youth, and a look at the Parable of the Pearl of Great Price in Matthew 13.45-46. Just before that we had a question and answer time from the team that are planning a move to two morning services at Blackheath to cope with the happy problem of a church building full to capacity, and I was able to share some of our experience from Holy Trinity, Redhill which had travelled down a similar road for the same reason. 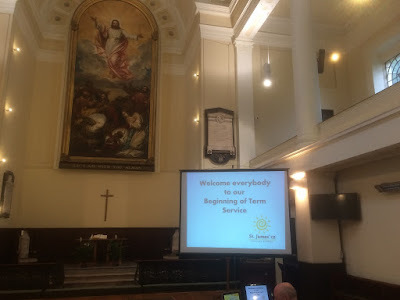 It was great to see St John's in such good heart and a great privilege to share the day with them. Discipleship Explored got off to a great start on Wednesday evening at St James with 40 people present for the first session. The course lasts eight weeks. Each session includes a meal, a video introducing the subject for the evening, and a time for discussion in small groups. That was a great reminder that God is at work in our lives, that he will never let us go. That he began a work in our lives the day we came to believe in Christ and that work (in the present,still unfinished) will be brought wonderfully and unfailingly to completion at the end of all things. 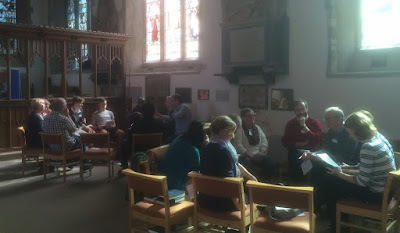 That was a great encouragement to us all as disciples of Jesus,and it made a great start to the course, which continues next Wednesday at St James 7pm. (PS It's not too late to join, just email or phone the church office to let us know you are coming). On Wednesday, in brilliant sunshine, we had the annual memorial service at the Age Concern Healthy Living Centre in Southwark Park Road. We are always delighted to be invited to lead this special event at which members of the centre remember those who have died in the past year. Our Schools Week got off to a great start at St James's this morning. Over the next few days we are welcoming 15 classes of children from St James's School and Riverside Primary. Each class visits three stations, to learn about the Bible with Jacob, Baptism with Paul, and Holy Communion with me. For the Bible (right) children get to see the Bible in Hebrew and Greek; in an English version more than two hundred years old and a version that we read today. They learn that the Bible is like a light to show you the way; like honey; and like Gold and Silver. They get to colour a bookmark showing all the books of the Bible. 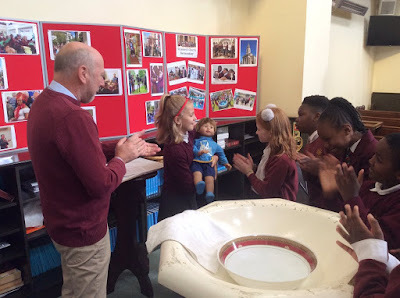 For Baptism they get to see how Baptism takes place at the font (above); to view the Baptism Register, with the names of all those who have been baptised at St James; and to make a badge bearing their own names, as a reminder that baptism is like a badge and that God knows us all by name. 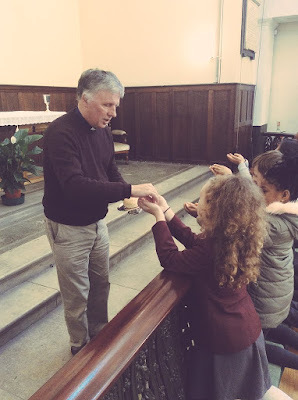 For Holy Communion, the children learn about the special meal that Jesus had with his disciples on the night before he died. They get to see the silver flagon, cup, and plate from 1829 that we use each Sunday. 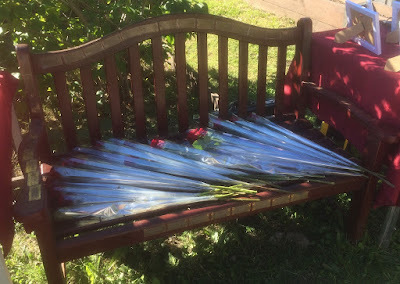 They get to kneel at the communion rail (left), and pretend receiving the bread and wine that we take to remember Jesus's great love in dying for us on the cross, then they stick to a paper plate pictures of the bread and the wine, together with the words that Jesus spoke at the Last Supper. Afterwards we shared what we had learned about these three wonderful ways that God speaks to us of his love. Thanks to St James Year 5 Twitter feed for the pictures. There were as Cockney as Pie and Mash and Jellied Eels. Famously they headlined at the Bermondsey Carnival in 2014. Yesterday we heard the sad news that Chas Hodges, one half of the famous duo, has died at the age of 74. I like that thought and I think it sums up why I liked Chas and Dave so much. This weekend has been a special time of celebrating the 150th anniversary of the founding of the Norwegian Seamen's Mission in Rotherhithe (left). The origin of the mission was in an evangelical revival that took place in the Church of Norway in the 1860s which led to attempts to minister the Gospel to Norwegian seamen around the world, including London. The Surrey Docks closed in 1972, but the Norwegian Church continues to serve an ex-pat community of around 20,000. Bergen, and clergy from both churches. Today there was a service of thanksgiving at the Norwegian Church, followed by a wonderful lunch, and, in keeping with the Norwegian theme, a concert of music by Greig. Congratulations to our Norwegian brothers and sisters on your 150th anniversary. 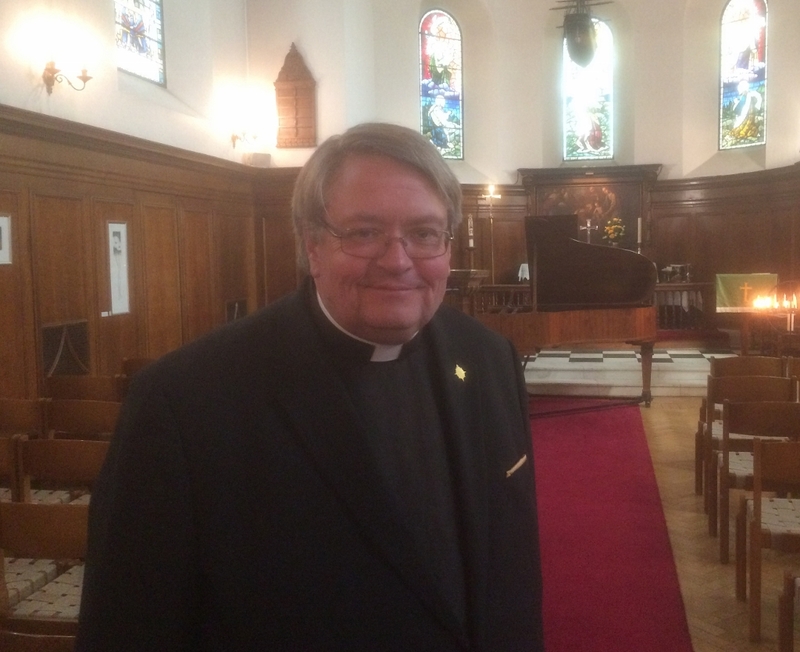 We love having you in our deanery. The Bermondsey Street Festival is getting bigger every year. Today there were hundreds of stalls, several live bands, and thousands of people thronging Bermondsey Street and Tanner Street Park. It was good to see St Mary Magdalen Church well involved with a barbeque in the churchyard (I can testify to the excellence of the Jerk Chicken), a bouncy castle, various sideshows and, in the church, a concert by the children of Boucher CofE school. Also taking part were such varied community groups such as Surrey Docks Farm, the Cathedral, and the LibDems! To the Norwegian Church (left) in Rotherhithe for a gathering of Area Deans from the Diocese of Bergen and our own Diocese of Southwark, which is twinned with that Norwegian Diocese. 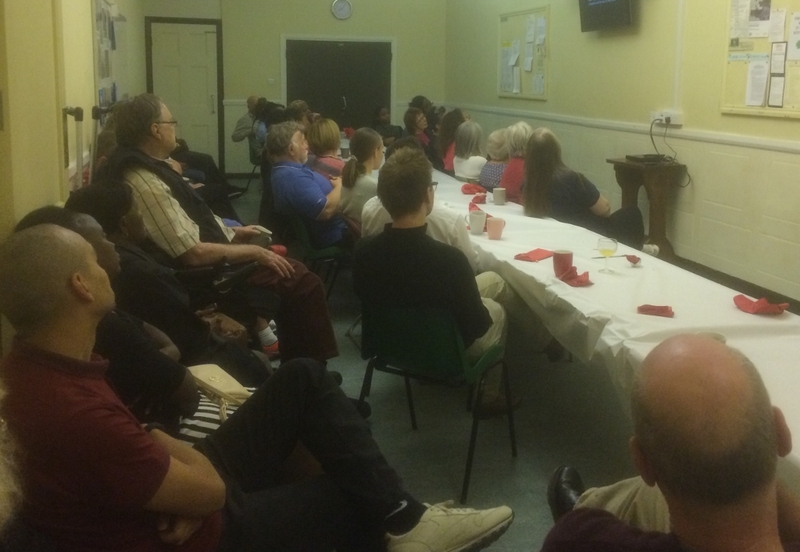 Here in Bermondsey we enjoy having the Norwegian Church in our deanery. Our links with Scandinavia go back to the days when many ships from that part of the world called at the nearby Surrey Docks. 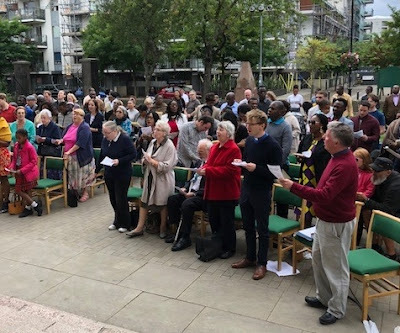 The docks are long gone but the Norwegian Church continues to serve the ex-pat population in London and Southwark Park, just across the road, is the centre of the London celebrations of Norway's national day. There are other big differences too. Area Deans in Norway are like line managers for the clergy in their deanery. 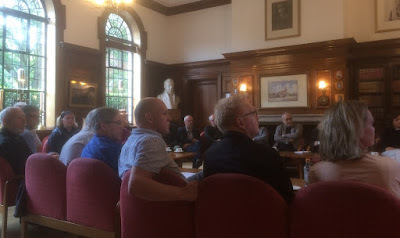 In England, the Area Dean is a first among equals, and the clergy gather as colleagues together for fellowship rather than to receive directions from the Area Dean. All in all, a fascinating afternoon, seeing some of the differences between our two churches, but recognising that the thing that unites us is our common faith in Jesus Christ. May God strengthen and revive his church in Norway and in England. 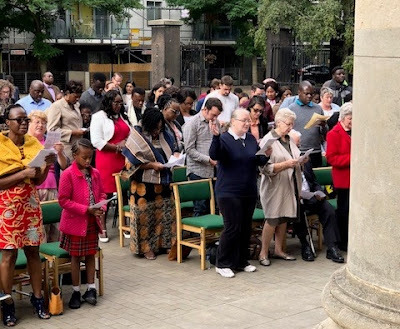 It was our last open air service of the year, but it was good to be together as St James and St Anne's churches to praise the Lord together in St James's Churchyard and hopefully share a bit of Christian cheer with our neighbours. The musicians from the Rhema Assembly Church, with whom we share the church building, contributed a beautiful song that enriched our worship and testified to our shared faith in Christ. Thank you, Pastor Danny, for organising that. Jesus was the one who had come as the king, and suffering servant, who gave his life for us on the cross, who brings good news, release for captives, and recovery of sight for the blind. He is the man who can put Bermondsey right, and put each one of us right, as we turn to him. Congratulations to Frankie and Sean, married at St James this afternoon. Every blessing to you both in your new life together. 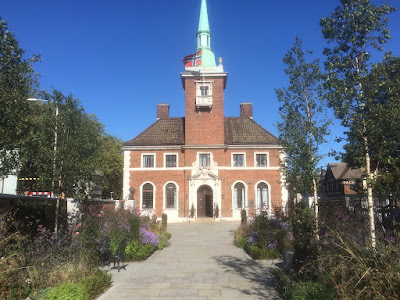 Just along the road from us in our neighbouring parish of St Mary, Rotherhithe, is the old building of the church school with these wonderful statues of eighteenth century scholars, a boy and a girl each holding a book. The book, of course, is The Book, the Bible, and it is a reminder that Christians were in the forefront of providing free education for poor children, centuries before the state took over that role. 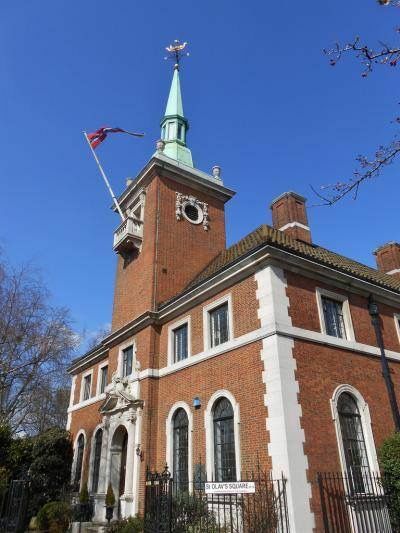 Peter Hill founded his school, which still bears his name in 1613, two and a half centuries before free education for all was provided by Act of Parliament in 1870. The significance of the Bible in the hands of the children was two fold. Christians wanted children to be be able to learn about God's world, and by learning to read, to be able to read God's word for themselves. The tradition of Church education continues not only in Peter Hill's School, the parochial school of St Mary, Rotherhithe, but also in our own St James's School, founded in 1841, which started back for a new term today with a service in the church. All bright and bushy tailled, refreshed after the holiday, children and teachers poured into church today to sing God's praise, to pray for the coming term, and to hear God's word. 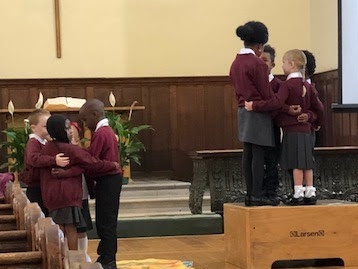 Some of the key stage 1 children helped me act out the story of the wise man who built his house on the rock, and we thought about the difference it makes when you build your life - and your school - on the solid rock of God's Word in Scripture. The house on sand (left) and the house on the rock. It was a good start back to a new term. 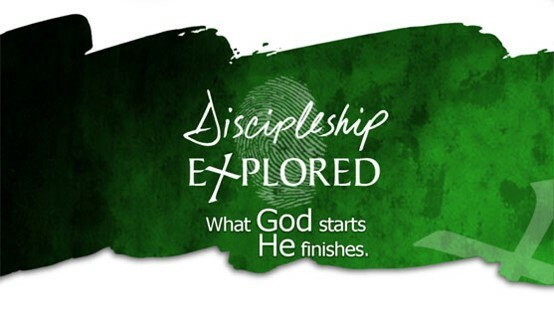 Discipleship Explored, an eight week video based course starts at St James on Wednesday 26th September at 7pm. Each session includes a meal. 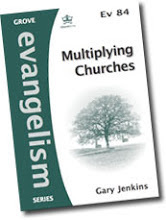 It goes beyond simply teaching the right moves - go to church, pray,read the Bible, share the gospel - and focuses on the music which drives discipleship: the love of Christ. The greatest love anyone can ever know. Contact the church office to book your place on the course.